A Myrrh Bearer should be eight years old. Commit to be active in the life of the church. Be a prayer pal for each other. Mentor future Myrrh Bearers by teaching the eighteenth lamentation stanza. Help in the narthex at least once a year. Serve or provide dessert for Union Station Homeless Services at least once during the year. When needed, help organize the narthex, nave, and solea. Help during Great Lent and Holy Week. Help in a Sunday school class at least once a year and begin receiving training to become a future teacher of religious education. Organize and serve during coffee following Divine Liturgy. 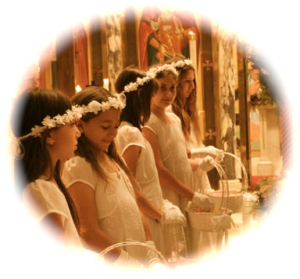 Attend Divine Liturgy as a group and receive Holy Communion. 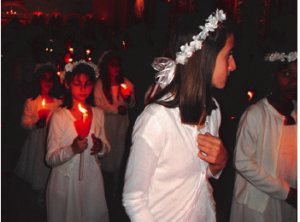 Meet on the third Sunday after Pascha, the Sunday of the Myrrh Bearing Women, and share experiences during Great Lent. Myrrh Bearers will tentatively meet at least once a month to discuss future outreach projects, with a special activity.